Last year, the University of New Brunswick’s Rock and Ice Club was faced with the possible loss of their space. But last May, the university’s board of governors voted to accept funding from the City of Fredericton and the provincial government to keep the Lady Beaverbrook Gym open for three more years. While much of the opposition to shutting down the facility occurred on behalf of the Sir Max Aitken Pool, the over 100 members of the campus’ only rock-climbing gym fundraised for a new facility and campaigned to keep the building open alongside pool supporters. 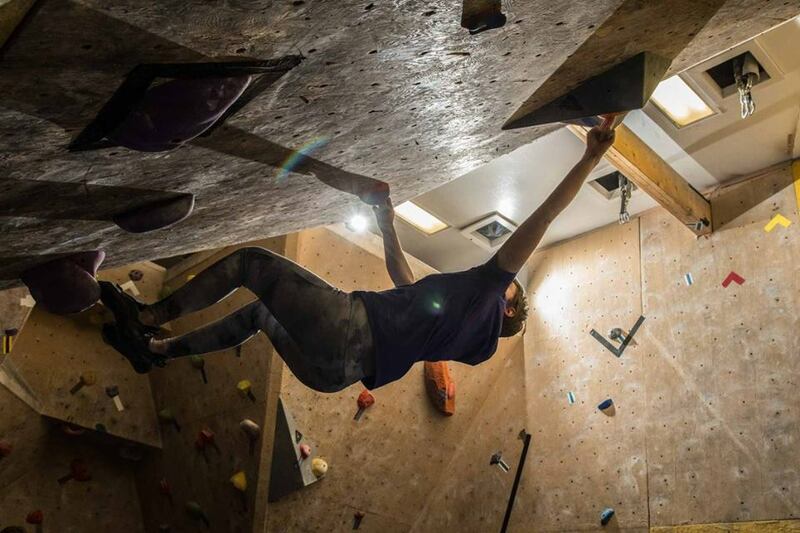 The gym on campus is a bouldering gym, different from the traditional vertical rope-climbing rock walls in most facilities – which makes it the only one of its kind in the capital region. Bouldering is a form of climbing without any ropes or harnesses, with a max height of about sixteen feet. While each type of climbing has its benefits and indoor top-rope climbing is more common, boulder climbing creates a close-knit group of climbers. There are other rock-climbing walls in the region, at Marysville in the community centre and in Oromocto at Base Gagetown, but this bouldering gym is the only facility immediately available to students and community members in the city centre. The Rock and Ice Club was formed in 1977 to organize outdoor trips, but eventually the organization strayed away from outdoor events to focus in on the bouldering gym. Dom Caron, the club’s treasurer, said the potential closing of the facility last year meant concerns over losing the friend group that had been formed through the club, and an end to bouldering. “The building and the wall is everything to the club,” Caron said. Once the announcement arrived that the Lady Beaverbrook gym would stay open, the climbing facility saw “an upsurge” in people who wanted to volunteer and participate in the gym. As the current gym’s life nears its end, a new organization has formed called the Fredericton Bouldering Co-op. The group is currently seeking investment opportunities to fund a new gym, and the Rock and Ice Club has made a $5,000 donation towards those efforts. The new bouldering gym plans to open in April and the club will be moving their activities there after the UNB gym closes. The bouldering gym is by far the cheapest option for climbing in the area, with an annual student membership fee of $50. Continuing to have a gym on campus is the best option for current members, the club said, and it makes climbing accessible to students and other low-income individuals. “Eventually this building will just be closed, so the best thing we can do for our members is ensure that in the future there is still bouldering in Fredericton and right now the answer to that is the [co-op],” Matchett said.